Sweat onion and garlic in butter for a few minutes. Add potato, cover with milk or water by 3cm from the top. Lightly season, bring to the boil, simmer 20-30 minutes, blend while warm, correct seasoning and consistency. Finish by adding 3 spoonfuls of emacadmia macadamia paste and cream and swirling through just before serving. 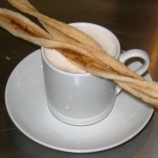 Make a bacon froth and layer on top after above steps. Serve in demitasse cups. Bacon froth is 2/3 milk to 1/3 cream. Soak bacon pieces in milk earlier in the day or the day before. Sieve, add cream and warm. Add knobs of butter, then froth with stirring stick. Layer on top of soup in cup like a cappuccino.